I recovered from a severe adrenal fatigue and this is my success story. In this adrenal fatigue recovery story I’ll give you some background info on my problems, a list of symptoms I had, and briefly list the treatments I did. I’ll also talk about the big turning point in my recovery. I’ll give more specific information about supplements and other treatments in other blog posts. Adrenal Fatigue Recovery Plan is a great place to start. Endocrine system problems run in my family so genetics play a role in my health problems. But that is not the whole story. I trace my adrenal fatigue starting point to my late teens when one spring I got sick with the flu. Before then my immune system was already weakened by poor sleeping and eating habits and stress of the teenage life. So I was sick with fever stuffiness, headache, body aches etc. It took me weeks to recover. It felt like I never got back to normal. Few months later I went to see a doctor complaining about recurring colds and constant post nasal drip. He put me on antibiotics. Throughout the college years I kept having colds; and I had my first ever ear infection. Then another. The rounds of antibiotics further depleted my immune system. I had a few eye infections too. Once I got several red blotches on my calf and was put on penicillin just in case. I ended up having an allergic reaction to it: rash all over my body. I also started to experience spring allergies and had the first sign of developing chemical sensitivity. In spite of the constant infections, I was still able to live my life. I was born and raised in Finland. When I was twenty-five I married my American fiancé and moved to the States (Hawaii to be exact). Dealing with the twelve hour time difference, completely different climate, and the emotional stress of moving to another country was too much on my already weakened adrenals. 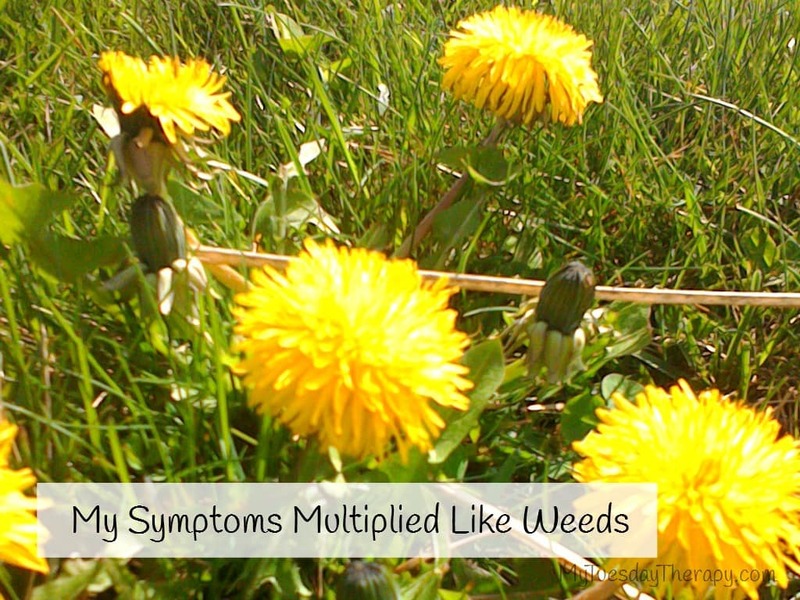 Within a month my allergy symptoms got severe. My recurring cold symptoms got worse. In six months I was so unwell that I always had tissue in my hand because I had a constant runny nose and sneeze attacks. My nose was always stuffy; I could not breathe out of my nose for eighteen months. Then thankfully one of the nostrils opened up. I kept having ear infections and sinus infections which were always treated with antibiotics. The climate was not good for me. Whenever I traveled back to Finland my allergy symptoms were less severe. During the first year I became severely sensitive to chemicals and mold. I could not be around bleach, laundry detergents, air fresheners, fabric softeners, perfumes etc. It was a struggle to find products I could use. Because of all the symptoms I had I could not sleep well. I forgot what it felt like to live without a headache. I was achy, stuffy, so ill…. and lonely. Here I was, in a foreign country losing my health, grieving for the loss of everything familiar. Then on top of that came more sorrow. I had a miscarriage, my husband’s brother died, his grandfather died, my dad had a stroke, I had another miscarriage, my grandmother died, and we also found out that my husband had a liver disease. All that happened within a ten month period. I was broken down. My health totally collapsed. When I was expecting our firstborn child, I did my best to eat well, exercise and so on. We had a beautiful baby girl who had a sleep problem. That is another story but it added so much to my stress. Having a baby is hard on your body. Having a baby with insomnia problem, when the mom is struggling with a chronic illness, was horrible. I kept getting worse. When our daughter was six months we moved to Maryland. My seasonal allergy symptoms somewhat improved. I was still sick 24/7 but the allergy symptoms weren’t as severe. I was not improving the way we had hoped. We had hoped that all it would take was to move away from Hawaii. So after a year we decided to move to an even colder climate. We chose upstate New York, close enough to a major airport making travel to Finland little easier. We had never been to New York, did not know anyone there. My husband did not have a job waiting there but we sold our house, packed our things and moved. Again my seasonal allergies got less severe but my other symptoms got worse. I had my third miscarriage. The stress of the move; the stress of having a house built by a builder who could not keep his word…I don’t want to bore you with the details but let’s say that after a few months when the house was supposed to be done we moved in… just in time… three days later I gave birth to another beautiful girl. The stress destroyed my adrenals little by little. I had no idea what was ailing me. The doctors were no help. So now I had two girls. One who still had unresolved insomnia problem. My health kept getting worse. I kept pushing through one day at a time. Isolated from the world because everything made me sick: fabric softener scent in friends’ clothes, their hair products, carpets in their homes etc. My home was my safe place. But I was so lonely. I had a fourth miscarriage. Upstate New York was great. Loved the mountains. But before our third daughter was born we started discussing moving again because of the ever-increasing property tax; and the possibility of tightening the already strict New York homeschooling laws. We decided to move to Michigan because it was and still is a homeschool friendly state; it is convenient for international travel and the property tax is not too bad. So, once again we moved to a state we had never been before, knew nobody there, had no job etc. We rented a condo, had a house built with no major problems. Yay! Ten years of marriage, four states, eight homes… And I’m a person who likes to have roots! My health kept declining. I was so tired all the time. So tired. I could not go to places because of the chemical sensitivity. Always at home…I was super lonely. I could have had friends come to my house but I never knew when would be the day I could stand up. When I did have friends over it took all my energy to cook. So with no energy left, I had trouble enjoying the time with them. I was exhausted, had heart palpitations and was in total brain fog. It was like in a Charlie Brown cartoon, you can hear the adults talking but can’t make up the words. Not fun life. The emotional stress, the constant inflammation, and lack of sleep took a toll on my body. I also went weeks without having any time for myself. I was too exhausted to leave the house to have some alone time. If I was in the house, the kids found me. My oldest slept so little that I was never awake and alone. It is hard for an introvert. I also felt guilty that my kids didn’t have grandparents nearby or anyone but us who would love them. So I tried to be everything and everyone to them. That is not the complete list but you get the picture. I was a mess. I ended up in the ER a couple of times for heart palpitations and feeling lightheaded. But I did not receive any real help from those visits. I was told though that I have low thyroid and need to get on medication. I did not want to start taking it. Finally, I accepted the fact that my symptoms are not just allergies but there is something seriously wrong with me. I started looking for a doctor who does natural treatments. I found a doctor who did not only help me but my daughter as well. She diagnosed me with adrenal fatigue. As recommended by my doctor, I began taking supplements to support immune system, adrenals and thyroid, to detox body, to support liver and heart, to heal gut etc. And I began to read about adrenal fatigue and searching for recovery stories. I wanted to know that there is hope. 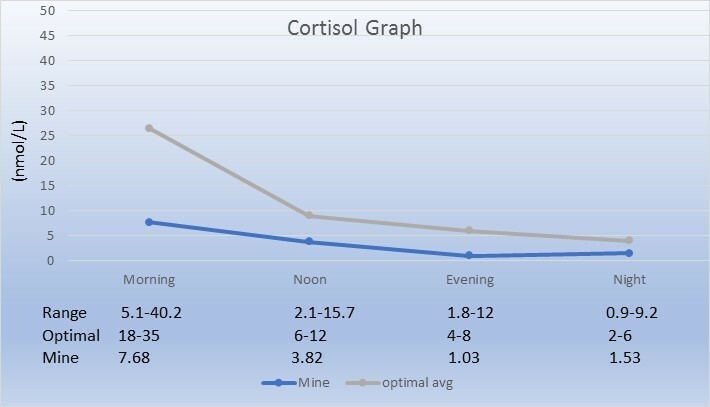 Here is a chart of my cortisol levels. As you can see mine were way below the optimal. I started to notice signs of healing. My seasonal allergies got less severe. But the healing was a really slow process. Finding the balance in supporting adrenals and thyroid was a challenge. Doing detox without overly stressing adrenals was a struggle. I had so many crashes and setbacks along the way. At times I was really discouraged. I was so tired of being tired. As I mentioned in my symptoms, I had started to gain weight. I had never struggled with weight and now I just gained and gained weight, fifty pounds in three years. Most of it I gained when I was exercising five times a week. I was silly enough to use my little energy for exercise. Exercise is good for you, right? My body could not handle the stress of exercise. I felt so awful after the exercising and finally had to give it up because it made me worse and I reached a point I was too tired to even attempt. Exercise also made my heart to do flips. Not good. It is little more complicated when you have adrenal fatigue. I was tired, frustrated and discouraged. But I kept pushing through. I did way more than I should have. I was a frequent visitor at my doctor’s office. During the recovery, I had many setback and crashes because I was not dealing with the big cause of fatigue. There were times when I would feel good for a day and hope that maybe it will last but I always crashed. My cortisol level at one point went even below what it was in the beginning. The lowest morning cortisol I had was 4.97 nmol/L. I went to Finland by myself. For the first time I was away from my girls. I stayed there for ten days. I was tired but I realized I was way more relaxed. My stress level was down. I was able to mentally and physically rest. No cooking, no meal planning, no cleaning, no homeschooling… no need to push trough. I love my children and would not trade being a mom to anything but during those ten days my mind rested, my body rested. I was not constantly focusing on everyone else’s need while completely ignoring mine. Finally, I really realized what a negative effect stress had on my health. In order to heal from adrenal fatigue, I must take time to take care of myself. The supplements can’t do it alone if I keep fighting against them. When I came back home I began to take time for myself. I listened to my body and gave it the rest it needed. I rested whenever I could even if it was just for a couple of minutes. Laying down was really beneficial. Stopped pushing myself to the point of collapsing. I did as much as I could in the mornings because when afternoon came I was done for the day… and then I stayed in bed as much as I could. Actually, I should have been in twenty-four hour bed rest but life does happen so I did what I could. I continued taking the supplements. I also did lymph drainage massage, skin brushing, acupressure, EFT, breathing exercises, dietary changes, drank salted water and so on. Slowly my energy level improved and I could stay up longer periods. What a joy it is when you can stand up and do dishes! I had good days followed by crashes but slowly the good times got longer and longer. I read that it takes about two to three months of healing for each year of adrenal fatigue. When I started my treatments I had had some symptoms for twenty years. After five and half years of treatments I felt like I got my life back. Almost all the symptoms were gone! It took me for a long time. But I was so messed up that it is no wonder. I also have the burden of genetics. My symptoms disappeared or got less severe one by one. I had one good day after another. I never thought I’d ever feel this well again. I’m so grateful to God for healing me and giving me the enjoyment of my life back. It is a wonderful feeling to be able to walk, shop, cook, and hang out with family and friends without crashing afterwards. I’m a sensitive person also an empath, other’s moods and emotions affect me, being around people drain me after a while. I’m an introvert who loves people…so I have to constantly balance that for my health’s sake. But I have learned what works for me. I still have hypothyroidism, I take supplements and do stress relieving breathing exercises, skin brushing etc. I still need to be careful not to overstress my adrenals. But even though I’m not 100% well, I consider these huge improvements in my health a success. 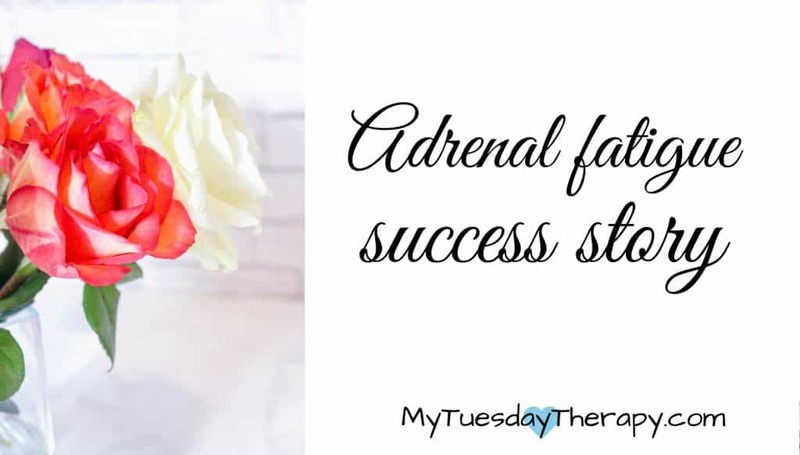 I hope my adrenal fatigue recovery story has given you the encouragement that recovering from even a late stage adrenal fatigue is possible. I pray that you too will be healed. You can find more information on the supplements I took and the treatments I did in my adrenal fatigue posts. It would be too much to put all that in one post. Check out also the adrenal fatigue recovery plan. If you have any questions, contact me. I’m not a doctor or any kind of health care professional so I can’t diagnose or prescribe treatments but I can tell you what I did.